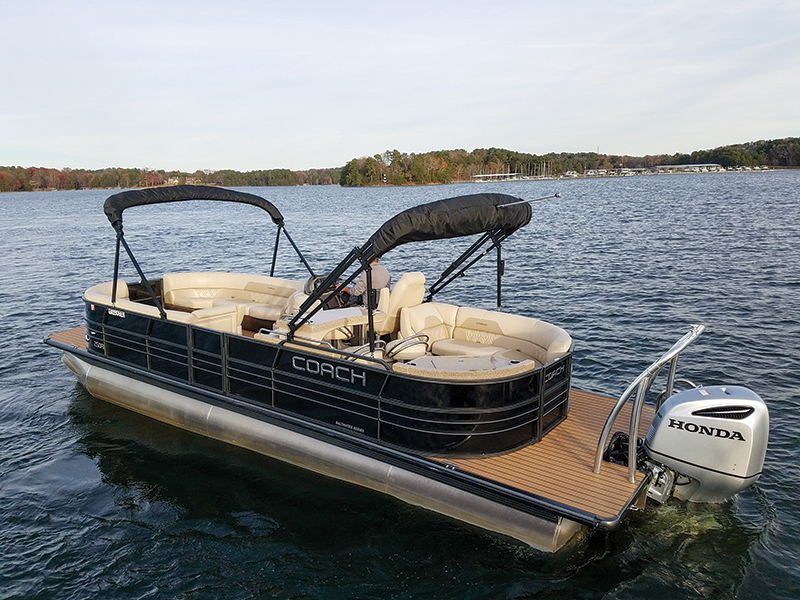 If the word Coach is on the side of a pontoon, no matter the model — we tested a Coach 250 RE — we know certain features are on board: a Simrad GO7 GPS/Fishfinder, a Rockford Fosgate premium stereo with at least four Bazooka Bass Tubes, a Gussi Italian sport wheel, Soft Touch upholstery, stainless steel cleats, a black Bimini top and a snapless boat cover. That’s a pretty impressive list of standards, which stems from the fact Coach doesn’t have a “price boat” in its fleet; there’s only one class, and it’s not coach. Ironic, right? 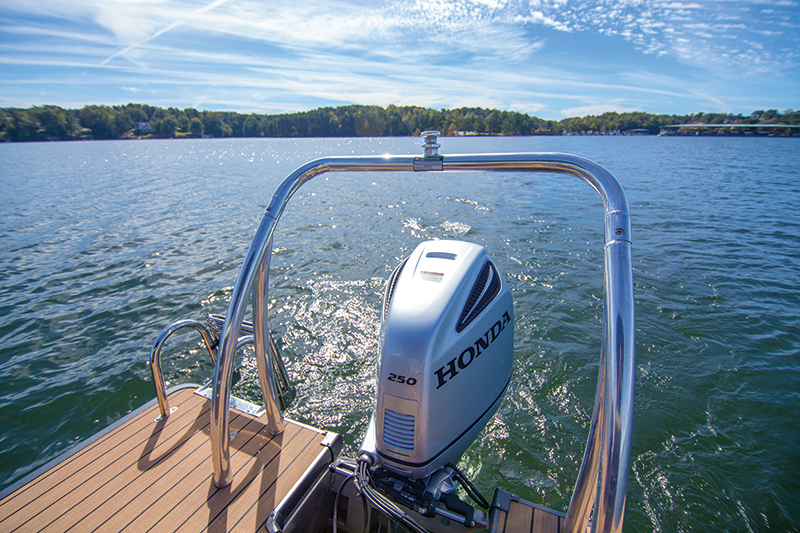 To reach its full performance potential, our 27-foot-long 250 RE test boat had the full triple-tube High Performance Package ($1,769) and a Honda BF250 motor, which is only a $2,107 upgrade over the Honda BF200 and will be a buyer’s easiest decision. Even with these upgrades, the price was $81,261. 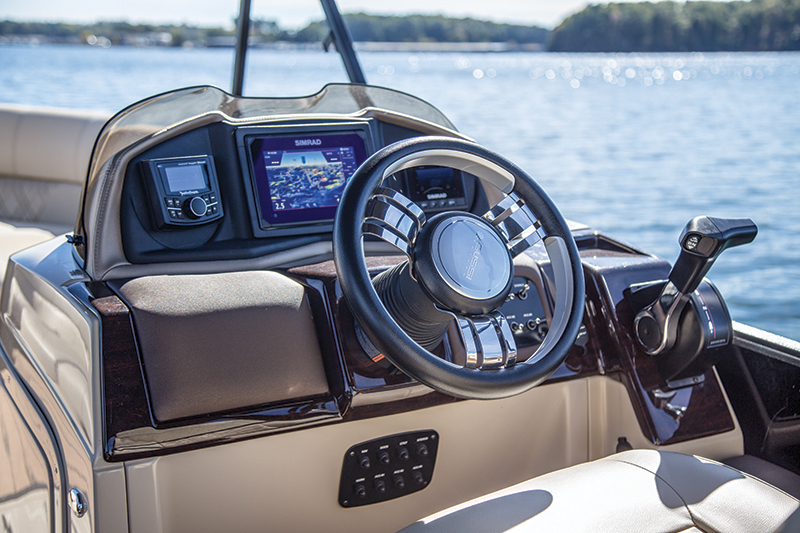 The Coach 250 RE (Rear Entertainment) is the builder’s full-bar boat and has a large, artfully asymmetrical table surrounded by four sturdy barstools. Lighted cupholders add to the nighttime ambiance and little touches such as a purse hook display great attention to detail. A J-lounge behind and to the side of the bar and two really long chaise lounges up front are all upholstered in passenger-pleasing Soft Touch. The seat bottoms have a scalloped contour and the two-tone upholstery adds some panache. 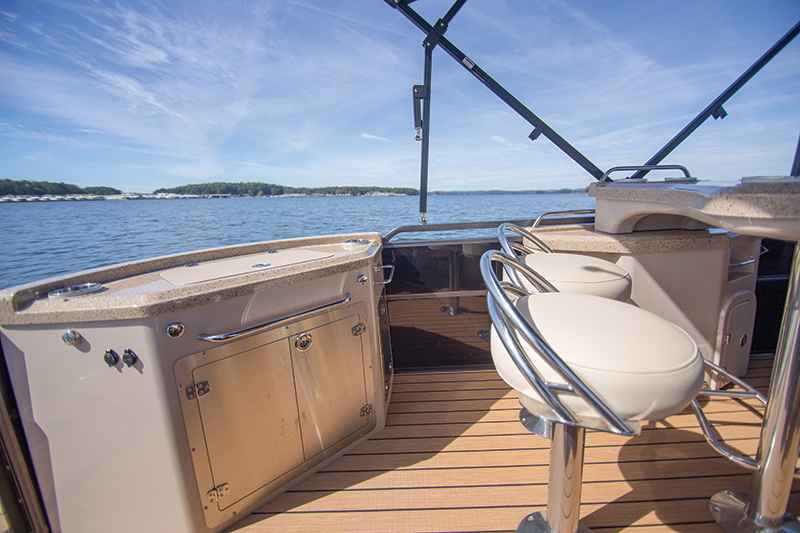 Our boat’s options included a double Bimini top ($2,057) that can shade the entire boat, teak-look Infinity woven vinyl ($1,176), which gave it a more nautical look than the standard vinyl, and a raised LED-lighted helm station ($1,172). 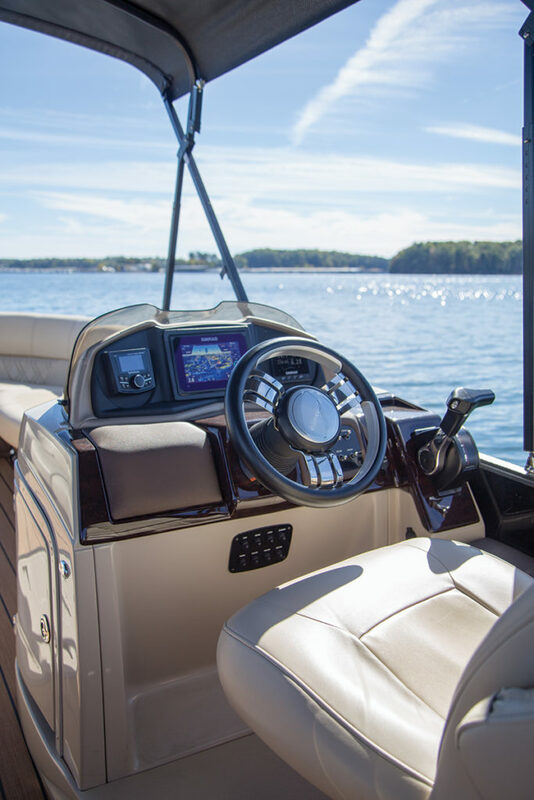 Coach signed an exclusive agreement with Honda Marine to be its sole engine supplier, and while some buyers might find that restricting, it comes with a giant perk: a 10-year motor warranty that matches Coach’s 10-year Stem-to- Stern warranty. Along with Honda’s reputation for reliability and excellent performance, it’s a great match. The Coach 250 RE we tested weighs 3,200 pounds and is rated for 15 people, so the BF250 is the way to go. It pushed the Coach on plane in 2.7 seconds and to 30 mph in 8 seconds flat. Its top speed of 38.8 mph will be plenty fast enough for all watersports. The in-tube ski locker is a pricey option at $1,724, but it’s needed. Time to Plane: 2.7 sec. Time to 30 mph: 8 sec.